IG II² 1252 (ca. 300 BCE): Table of Pentelic marble with two crowns (39 x 20–21 x 4 cm; letter height: 0.6 cm; non-stoichedon: 32–36 letters). Discovered alongside IG II² 1253 in the ruins of the shrine (Amyneion), at the western base of the Acropolis. IG II² 1253 (263 BCE): Fragmentary honorary decree (honoree's name missing). IG II² 1259 (313/312 BCE): Fragmentary honorary decree for the hosts (histiatores) Antikles and Kleitophon who supervised communal affairs and the sacrifices of the group. 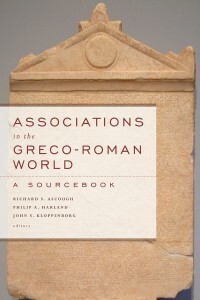 The members of this group devoted to heroes were citizens associated with two shrines: that of Amynos, a healing god, whose sanctuary was located on the southern slope of the Areopagus between the Areopagus and the Pnyx and consisting of an open-air shrine and a well; and that of Dexion, whose location is unknown but likely nearby. Several other dedications to the hero Amynos survive from the Amynos sanctuary (IG II² 4365 [along with Asklepios], 4385-4387, 4424, 4435). These may have been dedicated by members of the sacrificing associates, but this not to stated in the inscriptions themselves. Cf. Ferguson 1944, 86-91 (no. 7). Kleiainetos son of Kleomenes from Melite subdivision made the following motion: be it resolved by the sacrificing associates (orgeōnes): Whereas these men–Kalliades son of Philinos from Piraeus and Lysimachides son of Philinos from Piraeus–are generous in regard to the common affairs of the sacrificing associates of Amynos, Asklepios and Dexion, be it resolved to commend them on account of the excellence and honesty that they have exhibited both with respect to the gods and to the associations (koina) of the sacrificing associates, and to crown each of them with a golden crown with a value of 500 drachmas. They shall have immunity from “the heap” in both the temples, both they and their relatives. It is resolved also to give to them funds for sacrifice and for a votive offering, whatever amount seems good to the sacrificing associates. It is resolved to inscribe this decree on two monuments (steles) and to set one up in the sanctuary of Dexion, and the other in the sanctuary of Amynos and Asklepios, and to provide them with funds for the monuments (steles), whatever seems good to the sacrificing associates, so that others who are ambitious towards the association of the sacrificing associates might know that they (the orgeōnes) shall render thanks appropriate to the generosities of any who are benefactors to the association. (IG II² 1253 and IG II² 1259 are too fragmentary to translate. See description above). Κλειαίνετος Κλεομένους ⋮ Μελιτεὺς ⋮ εἶπεν· | δεδόχθαι τοῖς ὀργεῶσι· ἐπειδή εἰσιν ἄνδρες | ἀγαθοὶ περὶ τὰ κοινὰ τῶν ὀργεώνων τοῦ Ἀμύ|νου καὶ τοῦ Ἀσκληπιοῦ καὶ τοῦ Δεξίονος || Καλλιάδης Φιλίνου ∶ Πειραιεύς ∶, Λυσιμαχί|δης Φιλίνου ∶ Πειραιεύς ∶, ἐπαινέσαι αὐτοὺς | ἀρετῆς ἕνεκα καὶ δικαιοσύνης τῆ εἰς τοὺς | θεοὺς καὶ περὶ τὰ κοινὰ τῶν ὀργεώνων καὶ | στεφανῶσαι αὐτῶν ἑκάτερον χρυσῶι στε||φάνωι ἀπὸ ∶(500)⋮ δραχμῶν· εἶναι δ’ αὐτοῖς καὶ | ἀτέλειαν τοῦ χοῦ ἐν ἀμφοῖν τοῖν ἱεροῖν | καὶ αὐτοῖς καὶ ἐγγόνοις· δοῦναι δὲ καὶ εἰς | θυσίαν καὶ ἀνάθημα αὐτοῖς ὅτι ἂν δόξει | τοῖς ὀργεῶσιν. ἀναγράψαι δὲ τόδε τὸ ψήφι||σμα ἐν στήλαις λιθίναις δυοῖν καὶ στῆσαι | τὴν μὲν ἐν τῶι τοῦ Δεξίονος ἱερῶι, τὴν δὲ| [ἐ]ν τῶι τοῦ Ἀμύνου καὶ Ἀσκληπιοῦ· δοῦνα[ι] | δὲ καὶ εἰς τὰς στήλας αὐτοῖς, ὅτι ἂν δόξε[ι] | τοῖς ὀργεῶσι, ὅπως ἂν καὶ οἱ ἄλλοι φιλοτι||[μῶντα]ι περὶ τὰ κοινὰ τῶν ὀρ̣γεώνων εἰδό|[τες ὅτι χάριτας ἀποδ]ώσουσι τοῖς εὐεργετοῦ|[σιν ἀξίας τῶν εὐεργετημάτων]. θεοί· | ἔδοξεν τοῖς [ὀργεῶσιν· — —] | Ἱππομάχου ∶ Με[λιτεὺς εἶπεν· ἐπειδὴ —] | δωρος ∶ καὶ Ἀντ[— — ἄν]||δρες δίκαιοι γεγόνασι περὶ τὰ κοινὰ | τῶν ὀργειώνων τοῦ Ἀμύνου καὶ τοῦ | Ἀσκληπιοῦ καὶ τοῦ Δεξίονος, ἐπαινέ|σαι αὐτοὺς ∶ δικαιοσύνης ἕνεκα καὶ | στεφανῶσαι αὐτῶν ἑκάτερον χρυσῶι || στεφάνωι. τὸ δὲ ψήφισμα τόδε ἀναγρά|ψαι ἐ[ν] τῶ[ι] ἱερῶι ἐν στήλει λιθίνει. | vac. I know that reading ancient inscriptions can be a bit difficult, even once they are translated. The difficulty in translating from any language to another (especially with ancient languages) is that we simply don’t have the concepts that they had back then. In this case the groups like to name themselves the orgeones (it’s not the translators that introduce that repeated title). This word most likely derives from the Greek word orgia, which means “rites” or “sacrifices”. By sacrifices they mean the offering (ritual slaughter) of animals in honour of the gods. So they have named themselves “the ones who engage in the rites” or “the ones who engage in sacrifices” (for the gods). “Priests” might be an option for translating the term, however this would be a bit vague. “Fellow-sacrificers” would also be an option for translating the term as well, but “sacrificing associates” likewise communicates the meaning of the word (even if we moderns no longer understand the idea of animal sacrifice readily). I hope this clarifies some of the options. It’s perhaps the cultural difference between us and them that makes understanding difficult at times (less so the precise words that are chosen to translate foreign concepts). If you would like to read further on orgeones, there is a book length article on the subject (but it is somewhat technical): W.S. Ferguson and A.D. Nock. “The Attic Orgeones and the Cult of Heroes.” Harvard Theological Review 37 (1944): 61–174.